Windows 7 RC is out today. Because surely by now they've fixed Windows Explorer. You see, in Windows NT, 2000, XP and Vista, Explorer used to Hide extensions for known file types. 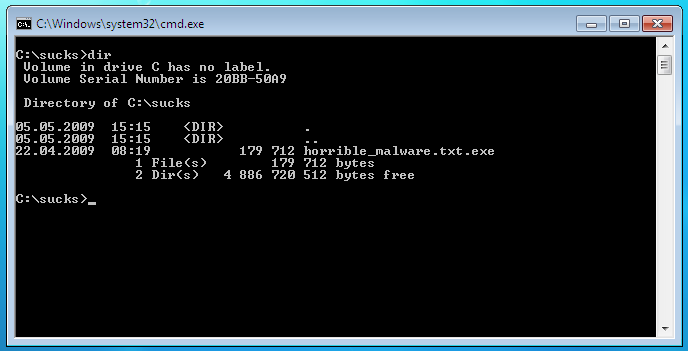 And virus writers used this "feature" to make people mistake executables for stuff such as document files. The trick was to rename VIRUS.EXE to VIRUS.TXT.EXE or VIRUS.JPG.EXE, and Windows would hide the .EXE part of the filename. Additionally, virus writers would change the icon inside the executable to look like the icon of a text file or an image, and everybody would be fooled. Surely this won't work in Windows 7. May 6, 2009 by Ben Pike.